A cartoon dog sits with a cup of coffee in a room that is engulfed in flames. “This is fine,” he says to no one in particular. These images, which originally appeared in K.C. Green’s webcomic Gunshow in 2013, have become a kind of shorthand for the mood in America after the 2016 election, an example of the ways that memes are increasingly relied upon by social media users to document their experiences in uncertain times. Social media encourages and profits from our impulses to document our present moods with image macros, reaction GIFs, screenshots, and other multimodal forms of expression. Memes have been remediated as protest signs at various marches, and it is increasingly common to see memes in political campaigns and in the Tweets of sitting senators. In July 2017, President Trump infamously circulated a meme in which he attacks a professional wrestler whose head has been digitally replaced by the CNN logo, an act of online speech that was interpreted by many as an endorsement of violent reprisals against journalists. Memes, in other words, are an undeniable part of contemporary American culture. This presentation will consider the roles memes have played in defining and subverting American political discourse in The Age of Trump. 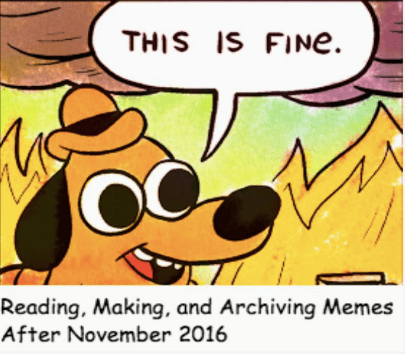 More generally, it considers where, how, and why public historians might read, historicize, preserve, and make memes about the American experience. You can find my full remarks on Twitter here, and I’ve embedded them below as well. Citations for images and screenshots, as well as suggestions for further reading, are below the embed. This content was selected for Digital Humanities Now by Editor-in-Chief Laura Crossley based on nominations by Editors-at-Large: Annemarie Perez, Greta Swain, LaQuanda Walters Cooper, Rebecca Kahn.